Shaver Socket. UK 3 Pin to 2 Pin Shaver Socket Only. 1 Amp Fused (BS646). Shaver Adaptor Toothbrush Shaving Oral-B 2 Pin to 3 Pin. 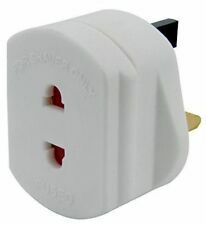 UK 2 Pin To 3 Pin 1A Shaver / Toothbrush Adaptor Plug. 2A power adaptor compatible with The USB cable will influence the plug's MAX output power. Input: 100-240V, 0.35A (MAX), 50/60Hz - Output: 5V, 2A. Ultra-Compact: USB port conveniently locate on the top of the plug, especially useful when using a plug at the bottom of a wall. 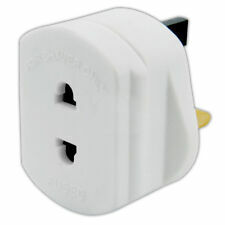 UK 2 Pin To 3 Pin 1A Shaver / Toothbrush Adaptor Plug. Shaver Adaptor Toothbrush Shaving and works for most. CE certified and fitted with a 1A fuse.